Last weekend, Swedish rockers, Ghost, ended yet another touring cycle in North America. This time around, Ghost was on the road behind their Popestar EP release. The tour kicked off in September at the Main Street Armory in Rochester, NY, where NYS Music was on site getting a taste of the band’s new show. After traveling throughout North America, the band made their way back to the Northeast to wrap up their tour in Montreal and Brooklyn. Friday’s November 11th show in Montreal, was an example of how much a band can improve over time. Compared to the first show of the tour, the band was like a well-oiled machine. After a lineup change and getting used to the differences, Papa (lead singer) and the Nameless Ghouls (bandmates) seemed much more comfortable together on stage. Compared to night one of the tour, the bass tone was much heavier and more prominent. Even though the band sounded great on stage, there’s still a big piece missing from Omega being gone. For fans who didn’t know, the original rhythm guitarist Omega had left the band before the tour and the Nameless Ghoul, Water, took over his position. 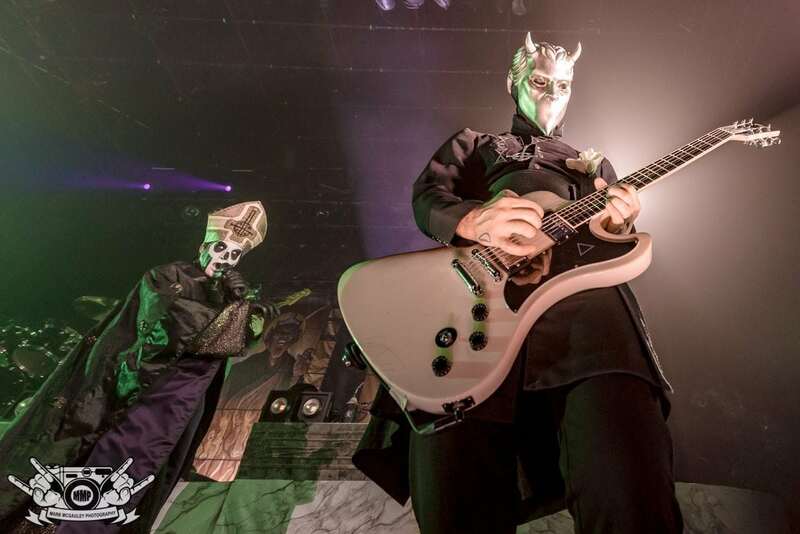 With a vacant bassist slot, Ghost recruited a new Nameless Ghoul. One of the biggest highlights of the show each night, was watching guitarists Alpha and Omega trade off guitar leads and rhythms. These two Ghouls are extremely talented and are a pleasure to watch on stage. Ghost brought most of its production that they had in Rochester, on night one of the tour. The restrictions for Ghost’s show varied from venue to venue depending on what was allowed. For instance, some of the smaller venues on tour like in Montreal, did not allow the band to fully utilize their production. On the other hand, at the King’s Theater in Brooklyn, where the tour wrapped up, Ghost was able to use everything they had with them. At the show on Saturday the 12th in Brooklyn, NY at the King’s Theater, Ghost was able to use their full production, which featured blasts of pyro from behind the stage. It was awesome being able to see Ghost end the tour in full force back in New York. For a band that was playing small clubs just a few years ago, Ghost is now selling out large theaters with ease and even adding second shows in some cities such as Toronto. It’s safe to say that Ghost is only going to continue to gain popularity with their next full release. Before the band played “Mummy Dust,” Papa Emeritus III went into a discussion aimed toward President Elect, Donald Trump. With all of the drama surrounding the election, going to a show was supposed to be a way to escape everything for the time being. But unfortunately, Papa decided to bring up politics and got the crowd going. Surprisingly the crowd in Montreal supported Papa’s views much more than Brooklyn did. Montreal really seemed to dislike Donald Trump and Brooklyn kept fairly quiet. But, once the band actually started playing “Mummy Dust,” all of that quickly faded away. The confetti cannons blew off, which also contained the popular “Mummy Dust Money,” which are fake bills with Papa’s face and 666 as the value. These bills are sought after by many fans and get shared in many fan groups online for people who couldn’t get any at the shows. As always, Ghost closed both shows with “Monstrance Clock.” The song is a great way to end the show, but there’s almost too much time taken before hand to introduce the song. The show is a “performance,” but realistically, if the conversation got cut down a bit, the band could play two or three more songs. At the end of the Brooklyn show, the final show of the tour, Papa thanked everyone and had the opening band come out on stage as well. Saturday’s farewell in Brooklyn marked the last time fans in the Untied States will see Ghost for quite some time. The Popestar Tour is over and it’s time for the band to work on their new album. There aren’t many details for the next album out yet, but it’s already been started and should be out by the end of 2017. Ghost has posted a teaser video already on their Facebook mentioning that Papa Emeritus IV is coming. With a new Papa Emeritus, it’s safe to assume that the Nameless Ghouls will also get a new look as well. It’s going to be a long wait for fans here considering they’ve essentially been spoiled with how often Ghost has come around. 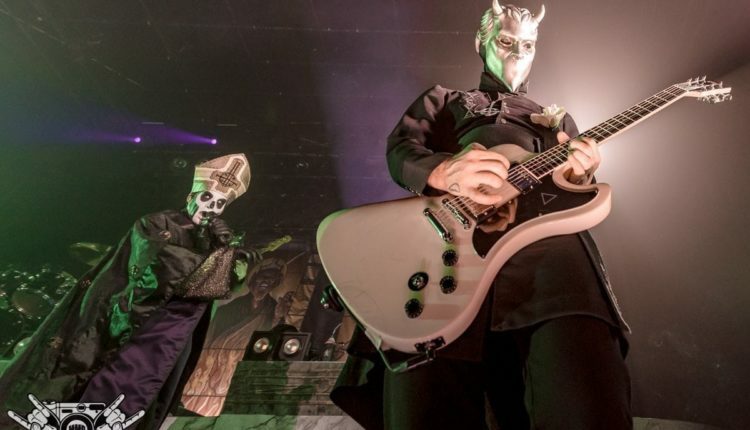 In the past year and a half, Ghost has hit many cities on the Black To The Future Tour, which lasted 2 legs, the Popestar Tour and other festival appearances such as Carolina Rebellion, Rock on the Range, Welcome to Rockville, and Rock N’ Derby. Be sure to keep a lookout on NYSMusic for Ghost news and the announcement for Papa Emeritus IV and the new album.